Expert Tips on How to Plan a Destination Wedding in Goa? He proposed; she said yes! Destination wedding in Goa; it’s decided! What next? Are you prepared to jump into the pool of planning and serious hullabaloo? Destination weddings is the ‘cool’ thing to do these days, but it’s not a cakewalk when it comes to pulling off even an intimate wedding as the chances of goofing up are considerably high. When it’s a destination wedding in Goa you intend to have, it becomes a mini vacation not just for you, but your family and friends too. Therefore, you need to be on your toes to get things working well in advance. We’re hoping you’ve popped the big question, at least a year ago, just so that you have plenty of time to arrange the best wedding you wished for. Breaking it into a timeline, we’ve made all efforts to form a guideline you can follow to effectively plan a destination wedding in Goa. Choose a Date :The date is the most imperative factor that can make or break your wedding. If you’re considering your wedding date to be at the peak season in Goa, which is somewhere in between September to January, then you’re in for a major blow regarding the budget. As this is the time when the “Susegaad Goans” are all up to make quick money. So, choose your date wisely. Decide on a Ceremony/Reception Theme : Having a wedding in Goa doesn’t limit you to an elegant Catholic style wedding. You could host either a church or temple ceremony and then have a reception at a fort, beach setting, or lavish 5-star venues. What’s your pick? Finalise Your Budget : Your decisions and bookings depend on this factor. So, make sure you stick to the budget and make your arrangements around it; trying to cut as close as possible to your final financial plan. Scout and Book Your Venue: Once you’ve finalised how you want to celebrate your union and have a fixed budget in place, begin scouting for that perfect venue. You can find some on our listings here. Once you’ve found your match, take a short trip to Goa, well not to relax but get busy. Go and check out the venue yourself and if you like their service, book it right away. 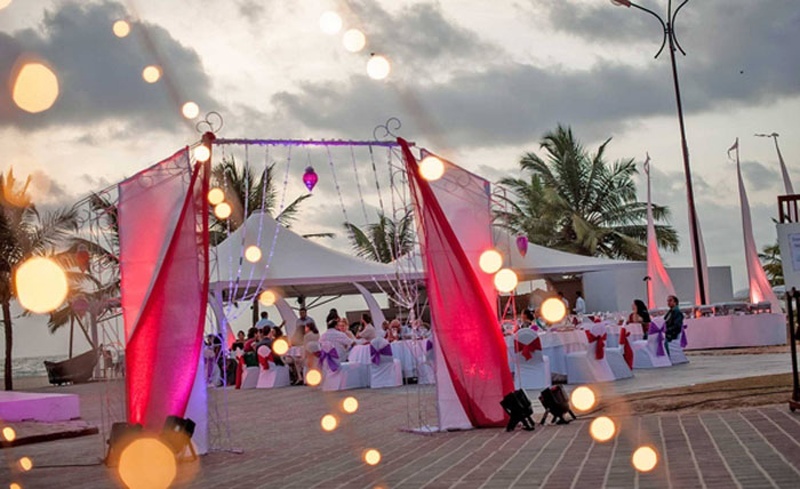 With hundreds of couples locally, nationally and internationally gearing up to plan a destination wedding in Goa, you wouldn’t want to lose out on the best venue. Once booked, make sure you have all the agreements of your venue on papers so that there are no last minute glitches and extra cost surprises on your big day. Compile a Guest List: Since it’s an outstation wedding, keep your guest list concise with just close friends, family and relatives as you will be bearing their costs. Learn About the Local Marriage Requirements: Find out if you require a marriage license to perform your wedding in Goa. Also, if there are any do’s and don’ts involved. Finalise Your Celebrant: By celebrant, we mean the person who will be conducting the wedding rituals; a priest in the case of Catholics or a pundit for a Hindu wedding. If you have a specific person in mind, then ensure arrangements for their travel and stay is made accordingly. If you want a local celebrant, then request your venue manager to provide you details. Book Your Vendors : Scout for vendors and book them well in advance to have your big day run smoothly. Prepare a list of the contact details and job allocations of each person to make notes of updates and confirmations. Book Your Travel Tickets: Booking tickets for Goa in the peak holiday season can be quite annoying and highly expensive. Get them booked 6-9 months in advance to ensure you or any of your guests do not miss out on your wedding day. Book Rooms: If your wedding venue and hotel are not the same, it’s recommended you book rooms for yourself and your confirmed guests at least 4-6 months in advance. It helps you grab your hands on better deals. Book Transportations/Transfers: This is one of the most important factors to consider when you plan a destination wedding in Goa. Since the city has vast stretched fields and beautiful surroundings, getting from one destination to another can get quite tedious. Once you have a fair idea of your flow of events, make transport arrangements to make transfers easy for you and your guests. Confirm Details with All Vendors : Call and get approvals on all arrangements with your vendors. Also, confirm their timing availability on your event dates. Make sure you have all the agreements made by both the parties in writing. Send out Invites: Though your guests are aware of your awesome wedding in Goa, send out formal invites to them and get their final confirmation. Dress Trials: Get your dress trials done and make sure the bride and groom’s look is perfect before you pack your attire to carry it to your destination. Get Hotel Accommodation Confirmation: Call and confirm your hotel accommodations booked earlier. This is also the best thing to do a month prior as you can request the hotel to accommodate few more guests who may confirm their attendance later on. Confirm Your Travel Booking: Check if, at all, there are any changes made to your travel bookings and get them fixed so that you’re not stuck up when you need to be at your venue. Re-Confirm All Details with the Vendors: Just follow up on things that are yet to be arranged with all your vendors and request a final confirmation. Pack and Coordinate: Don’t sit for last minute packing. Keep one entire week dedicated to only packing your things so that you don’t miss out on your exquisite jewellery or one of your sandals that were supposed to be worn at your functions. Coordinate with your family and close friends to carry some additional few things you require at the venue. Visit the Ceremony and Reception Sites: When you reach Goa, make sure you visit your ceremony and reception site to discuss the complete flow of your wedding. Make Sure You Have Your Rings: With everything arranged well in advance, you don’t need to be running around making sure everything is flawless. Just keep in mind to carry your rings and be prepared to exchange your wedding vows. Sit Back and Enjoy Your Big Day: With all things falling perfectly in place, simply sit back and watch your wedding tale unfold. We hope this brief checklist helps you to easily plan a destination wedding in Goa. If you think all of this is too much to handle, you can always opt to hire a wedding planner.